I burst into the suite at quarter after nine and went straight into my bedroom. “I’m vacating anyway.” I opened my suitcase and threw the clothes I’d left out into it. “What’s the matter?” Sid came to the bathroom door. “We already live in the same house.” It’s Sid’s house really, and our bedrooms are on opposite ends. “Well…” Flushing, I jammed my nightgown into the suitcase. I had kind of forgotten to tell my parents about living with Sid when he hired me. I looked around for my deck shoes. I looked under the bed. The shoes were there, but beyond them was something else. I grabbed a towel that had fallen near the foot of the bed and covered my hand with it. “Don’t tell me those deck shoes of yours finally started growing something,” said Sid. He hates my deck shoes. “I’m being framed,” I whispered. “I’ll get it,” I said mechanically, then went. Sid slid quickly into his room. I can’t say my father looked happy when I opened the door. Tall and broad shouldered, he has that rugged mountain man look about him, right down to the strong silent demeanor. Mama, on the other hand, was bubbling over. She’s small, with bright, flashing eyes. They’re both from southern Florida and still have fairly strong accents. “Lisle, baby!” Mama crowed, throwing her arms around me. Lisle is my parents’ pet name for me. “Hi, Mama,” I said, still nervous. I hugged her, then Daddy. “Nice enough,” grumbled my father. He shot a brief glare at Sid, who mercifully ignored it. Daddy, unfortunately, is not very tolerant of effeminate males, and he considers Sid’s urban polish sissified. He is also convinced that Sid is going to turn me into a fallen woman. But the really weird thing is that Daddy is extremely jealous of Sid. “Oh, I trust Lisle.” Daddy sent another quick glare Sid’s way. “Well, Sid, how long y’all got this room paid up for?” asked Mama. “We’re fine here, Althea,” said Sid. “I don’t want to impose,” said Sid. Sid looked over at Daddy. Sid shot me a puzzled glance, then played along. But Daddy caught him. Glaring at me, he folded his arms. “Nothing, Daddy.” I swallowed nervously. “Well, I…” Frantic, I looked to Sid for help, which was pretty stupid given how sure Daddy was that Sid was the cause of it all. “That was Lehrer?” I asked. She took Daddy’s arm and steered him out of the room. “Let’s get going ourselves,” said Sid, heading into his room. “What about packing?” I followed him to the door. I grabbed my purse off the sofa and scrambled after him. The elevator opened just as we arrived, letting off a bellhop and an elderly couple. “No.” His pace quickened as a sheriff deputy wandered up to the check in desk. We slid around him out to the parking lot and the car. “Why not?” I asked, getting in. Sid backed quickly out of the space and took off. Doing without was out of the question. “Do you have to have your own place for that?” I asked. “Provide services yourself?” Sid asked, with one eyebrow raised and this little smile he has that is about as arousing as a smile can get, and I know he’s mentally doing it with me, and I still get goose pimply and hot and bothered over it. He glanced my way. I blinked twice. Everyone was really nice at the sheriff’s station. We turned the gun into Lieutenant Larry Roth, my friend Jimmy’s uncle. 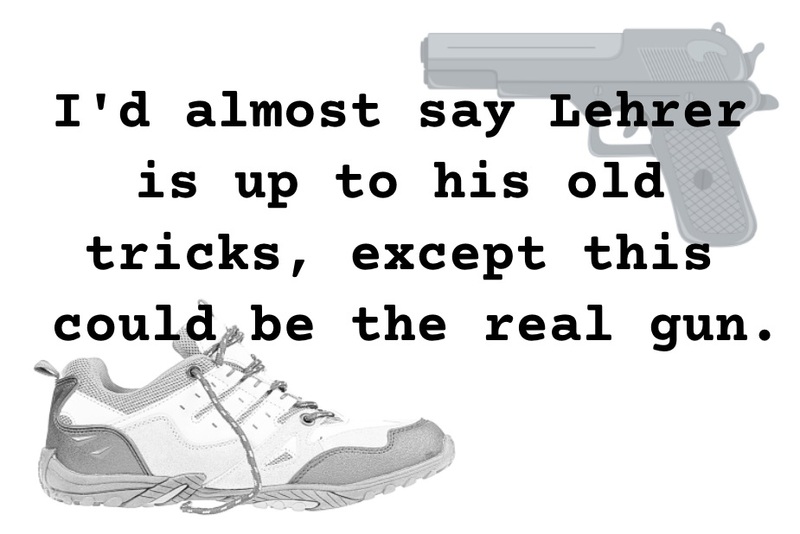 Uncle Larry picked up the gun and shook his head. “Where did you find this?” he asked. “Why do you say that?” asked Sid. Sid waited until we were back on the road before he asked about Jimmy’s number. By the time we were done packing and paying off the hotel and got out to my parents’ house, my parents were already back from mass. As Sid parked the Mercedes in the driveway, Murbles and Richmond came running up, barking their deep roaring barks. They’re so huge, they can be pretty intimidating. Sid at least had the sense not to let on if he was. He did hesitate before getting out of the car until he saw me getting out. “They are hardly babies,” said Sid, shutting the door. Murbles whined a little as he went over and sniffed at Sid. Sid hesitated then gave Murbles a quick scratch behind the ears. Richmond came over to investigate and got the same perfunctory scratching. I looked at Sid, puzzled. “You don’t seem to dislike dogs,” I said. Sid opened the trunk. Daddy appeared from around the corner of the house. “This all yours?” Daddy asked picking up the two suitcases. “No. That one’s Lisa’s.” Sid pointed. “Matching luggage.” Daddy glared at Sid. It matched because Sid and I had had to travel as husband and wife on other Quickline business, but I was really going to tell my dad that. Daddy looked at Sid. Sid smiled back, even if it was forced. Daddy went on into the house and we followed. “It’s very kind of you to put me up,” said Sid politely. “Oh, not even five hours,” said Mama. “Driving speed limit, of course,” I said. “Well, of course, he does, Lisle,” said Mama. “Oh, goody. No running,” I said. “Bill and I will be waiting for y’all in the kitchen.” She wandered off. We went into the living room first. Sid spotted the piano and went over to it. “That’s from when Mae and I took lessons,” I explained. Mae is my older and only sister. Sid played a major scale. He’s been playing since he was six, and he’s really good. “I’m sure she will.” Sid smiled and followed me into the dining room. I pointed out the kitchen, then led him back through the entry into the back of the house. We poked our heads in. The phone rang, but I ignored it. Sid nodded, then followed me to Mae’s room. Neil is Mae’s husband. Besides Darby and Janey, they also have Ellen, Marty, and Mitch. “Will there be room?” Sid asked. The O’Malleys adopted Sid a couple months after I had started working for him, which was a little surprising since Sid is not overwhelmingly fond of children. But Mae’s kids adore him and he’s very close to them. “I think we can stick around even if it is,” said Sid. Sid showed up in record time wearing a shirt, sweater, and tight designer jeans. Mama piled us into the jeep as Daddy gazed thoughtfully at the fenders. “Althea, didn’t you take this to the car wash before we left?” he asked, puzzled. Daddy didn’t seem convinced, but let it go. “Really?” Sid’s interest was definitely piqued. So was mine. We both love spicy food, the hotter the better. It had come as a bit of a surprise to us since Sid’s system is pretty touchy and while I’ll eat almost anything, I don’t really come across as someone who would enjoy eating fire. But earlier that July, we found a bag of different chiles on our doorstep. It turned out one of Sid’s girlfriends had brought it over as a joke. She plants chiles to keep pests out of her garden, but can’t stand the product. She figured Sid would laugh, then throw them away. Sid and I arm wrestled each other for the last serrano. At the restaurant, the waiter brought us a bowl of raw jalapenos and serranos right away. Daddy helped himself, but Sid hesitated. “Party tonight,” he said quietly. Sid took a couple jalapenos while I munched on a serrano. Daddy had already broken a sweat. Sid glared at me. Little beads of perspiration had popped out all over his forehead. “Lisle, ’tisn’t nice,” said Mama. “Well, it’s not that big a deal,” I said, eating a jalapeno. “I’ve about had enough of this,” growled Daddy. The waiter brought us killer salsa, made with fresh chiles and tequila, and took our orders. I scarfed, Sid ate more than usual, and Daddy glowered. “Bill, y’all planning on going in to the store tomorrow?” Mama asked as we finished eating. “What’s the matter?” he asked, glancing at Sid. Sid, on the other hand, would just as soon have had someone else. But he didn’t say anything. He quietly pressed the back of his hand to his lips. I got out the Alka Seltzer. Chuckling, Sid placed his water glass in front of me. Daddy hesitated but added his glass. I fished out the ice, then dropped the tablets in. We waited a moment for the tablets to dissolve, then Sid and I each took our glasses and clinked them together. He just clinked my glass, and the three of us drank and grimaced. “Man, this stuff tastes aw-” I didn’t get any further because this horrendous belch took over. Sid sat back and laughed quietly. Daddy laughed loud and hard. “It was an accident,” I groaned, beet red. “Of course it was, honey,” said Daddy, wiping his eyes. “Let’s just be thankful for open cars,” said Sid. We looked at each other and laughed. Daddy’s eyes narrowed and he glared at Sid even harder. Back at the house, Mama coaxed Sid into playing the piano. Daddy disappeared. I started to go after him, but Mama stopped me. “He just needs to be left alone,” she said. She and Sid spent the afternoon chatting, while I fretted. But there wasn’t much I could do. Daddy showed up for dinner and was less than enthused when he found Sid had been helping Mama. He disappeared again right after eating. Sid and I cleaned up while Mama went to talk to him. She came back, shaking her head. “We’re just good friends, Althea,” said Sid. “I’ll walk you out,” I said. We were silent until we hit the porch. “You’re welcome to come if you want,” said Sid, mischief in his eyes as always. “It doesn’t sound like it.” I grimaced. “Is that even possible?” I smirked. “I wasn’t planning on going,” I grumbled sourly. He left, and I watched while he backed the Mercedes out of the driveway and drove off. “I’m going to take a walk down to the horse barns, Mama,” I called into the house, then took off myself. Behind the barn, Daddy was stacking bales of hay onto a rack of pallets under a shelter and cursing to himself about that snake. “Daddy?” I asked, pretty sure which snake he meant. “Oh, Lisle.” Sullenly, he dumped the last bale. And for the moment, all was right with my world. Who cared about spies and jerk investigators and mysterious packages of cocaine? My Daddy loved me and wanted to play Monopoly with me and that was all that mattered.